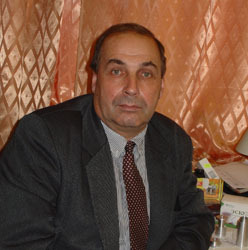 The head of the laboratory is Korshunov Igor Georgievich, Doctor of Physics and Mathematics, professor, the author of more that 80 scientific papers, eight author,s certificates for invention and one patent. The laboratory was created in 2001 on the basis of the group of high-temperature measurements, which worked as a part of the Institute from 1991 under the direction of professor Zinoviev V.E. Laboratory staff: 7 persons, including one Doctor, three candidates of Physics and Mathematics, one research associate, one post-graduate student. Development of technical means for pulse measurements. The workers of the laboratory have developed a theory of the dynamic method of flat temperature waves, which makes it possible to measure the thermal diffusivity of thin metal plates of small size in conditions of continuous heating in both solid and liquid states. On the basis of this a specialized measuring complex has been created. It realizes automated amplitude-phase processing of the parameters of the variable field created in metal samples under investigation by a modulated flow of electrons in conditions of rapid heating (up to 1000 K/s) in the temperature range from 900 to 3000 K with a temperature step of 1-3 K. The measuring complex makes it possible to determine the thermal diffusivity of metals and melts in the vicinity of structural and magnetic phase transitions , including the region of existence of the liquid phase, on samples in the form of thin flat-parallel plates 10 mm in diameter with a thickness of no more than 1 mm, an error that does not exceed 3.5 % and a resolving power of about 0.5 %. Synchronously with measurements of the thermal diffusivity one can control the sample state with the help of a telecamera. A technique has been developed and an automated measuring complex has been created for determining the thermal diffusivity of metals and melts by the method of flat temperature waves in the temperature range from 800 K to 1300 K at high pressures on samples 0.5-5 mm in diameter and 0.03-0.04 mm in thickness. Temperature waves in a sample are generated by modulated laser radiation. The development of laser methods for contactless measurements of thermophysical properties with a high degree of locality made it possible to create an automated complex (“optical thermal microscope”) for controlling the distribution of thermal properties over the surface of a sample with a resolution of 50 mcm. On the basis of the methods developed one can control the adhesion of film coatings and reveal the presence of small-size structures in near-surface layers of a sample. With the help of this apparatus high-temperature measurements of thermal diffusivity have been made for practically all transition metals, including Fe, Co, Ni, Ti, Mo, W, Ta and also a great number of various metal alloys, and data on the behavior of thermal diffusivity of metals and alloys in the vicinity of temperatures of structural and magnetic phase transitions in both the solid and the liquid state have been obtained for the first time. For the first time data have been obtained on the thermal diffusivity of submicrocrystalline samples of metals and alloys obtained by high-energy loading.